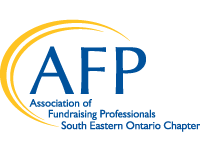 In case you needed another great reason to become a member of the AFP South Eastern Ontario Chapter, we have one for you! We are introducing a new lending library for all AFP SEO members. The library will consist of various literature related to fundraising. These books have been recommended by our faculty and speakers. Whether you are preparing for your CFRE exam, exploring how to grow your not-for-profit, or just expanding your fundraising knowledge, our library is here to help. Just sign a book out for three weeks, then return it, and borrow another, free of charge! Please contact Nikki Beaulieu (nbbeaulieu@gmail.com) or our Chapter Administrator (afpseo@gmail.com) if you would like to sign out a book.